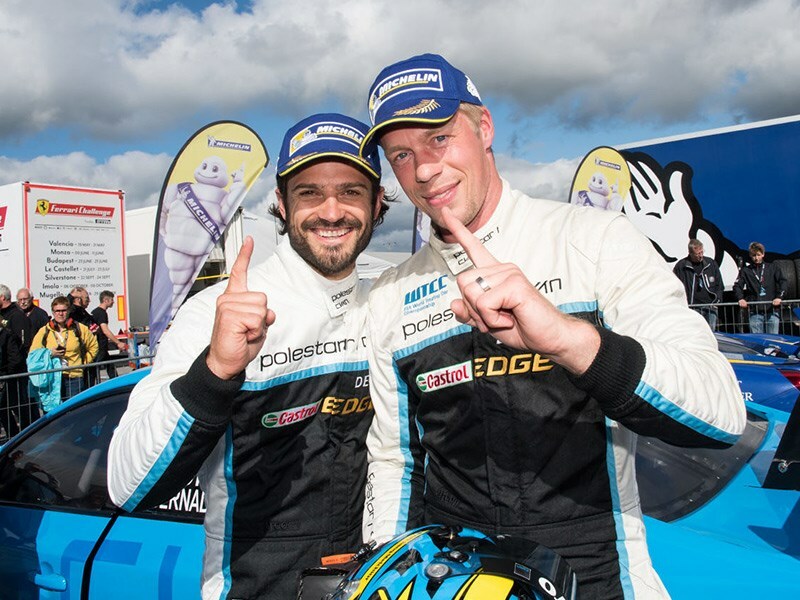 The Polestar Cyan Racing duo Prince Carl Philip and Thed Björk won a thrilling second Swedish GT race at Karlskoga to climb the championship standings to second position, within reach of the lead. Prince Carl Philip started the race from third position on the grid and made his way past Ferrari driver and title rival Ingvar Mattsson early on. ”I am very happy with this win and to move forward in the championship. We had a good race today and Thed did a stellar job as usual. I am looking forward to build on this success for the final two races,” said Prince Carl Philip. Björk took over the wheel during the mandatory pit stop and was able to get past race leader and former championship leader Jan Brunstedt, a lead he was to keep until the chequered flag despite hard pressure from Ferrari driver Fredrik Larsson. ”It was a great race, I had to attack really hard throughout my entire stint. Prince Carl Philip did a great job again, handing the car over to me in second place. The car felt perfect and a big thanks to everyone in the team that made this victory possible,” said Thed Björk. The victory, the second of 2017, has elevated Prince Carl Philip to second position in the championship, just six points behind Ferrari 488 drivers Larsson and Mattsson. ”We had high ambitions for this weekend and while our results in the first race was hindered by difficult conditions, day two went according to plan. Thed, Prince Carl Philip and the team did an amazing job and we look forward to the final two races with confidence,” said Alexander Murdzevski Schedvin, Head of Motorsport at Polestar.